, a canon of Zurich, and professor of natural philosophy and mathematics in that university, probably belonging to the same family as Conrad, was born in 1709. He studied at Leyden and Basle with Haller, and maintained a close correspondence with him during the life of that distinguished man. Their taste for botany was the same, and their characters similar. His letters make an interesting part of the “Epistolae ad Hallerum,” and abound with solid and curious botanical criticism and information. He paid much attention to the cryptogamic class, and other difficult branches of the science, as well as to the anatomy and physiology of plants. He survived his learned friend twelve years, dying in 1790, at the age of eighty-one. This author published two physiological dissertations on plants in 1740 and 1741, reprinted at Leyden in 1743, along with Linnæus’s “Oratio de peregrinatione intra patriam.” In these he treats of the life and structure of vegetables, their propagation, sexes, elastic motipn of some of their stamens, and their methodical classification. 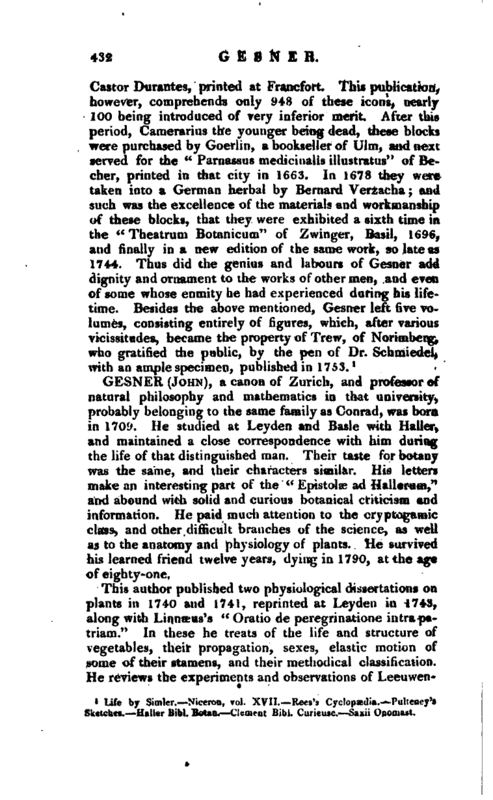 He reviews the experiments and observations of | Leeuwenhoeck, Malpighi, Grew, Hales, &c. announces the then hovel system of Linnæus, whom, with a kind of prophetic spirit, he calls “a man destined to reform all natural history.” Yet with all their knowledge, Gesner and Haller were imposed on by one of the grossest deceptions. A person presented him with a common meadow Crowfoot, on some branches of which were stuck flowers of the common daisy. He immediately published, in 1753, a learned dissertation on vegetable monsters, entitled “de Ranunculo bellidifloro,” in which he exhibits a figure of this strange anomaly; and the mistake remained undetected till sir Joseph Banks obtained the original specimen after Gesner' s death. On its being softened with boiling water, in the presence of the president of the LiniiEean society, and several other botanists, the stem of the ranunculus came out of the base of the daisy, as from>a sheath; and indeed the different pubescence of each was Very distinguishable before their separation. 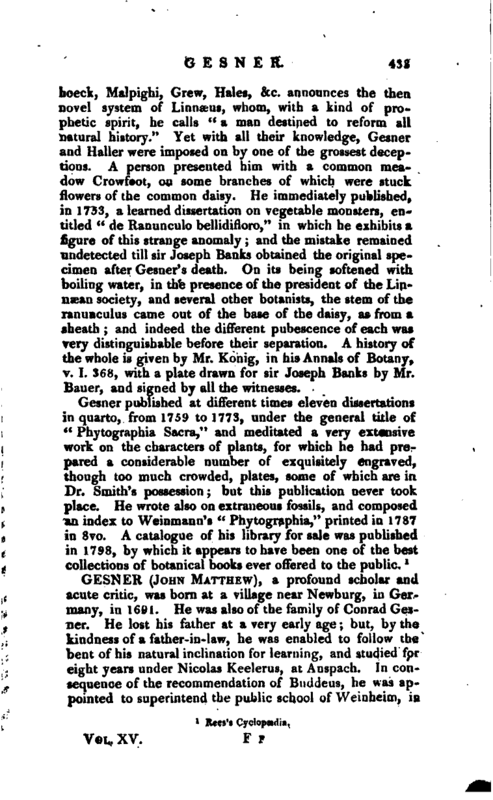 A history of the whole is given by Mr. Konig, in his Annals of Botany, v. I. 368, with a plate drawn for sir Joseph Banks by Mr, Bauer, and signed by all the witnesses.